Years ago I worked in a pub in London, England. 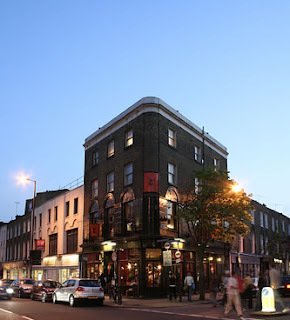 It was located on Upper Street in Islington, a neighbourhood that was moving upscale but, like most of the city, still had its share of decent lower class residents and a heaping of scum. There were plenty of pubs along the stretch where I worked. Because it was on the high street, numerous people blundered in simply to use the toilets. Some felt the need to order a quick half a pint, take a sip, duck into the toilets, and then return to slug back their drink and be on their way. Leaving us to wonder if they were trapped in a hell of forever nipping in to subsequent establishments to buy the obligatory token drink, draining their bladders and continuing on. Others had no reservations about striding in to use the loo and then leaving without a word of acknowledgment. This was annoying because the task of cleaning toilets was down to the bar staff. Also, more than a few heroin users shot up in the bogs and left their used needles on the floor. So we banged up a sign stating that only patrons could use the toilets. This worked for the most part. One afternoon a group of regulars was knocking back pints in the pub. A rare graveyard shift with some activity and a buzz happening. I was in one of those moods that allowed me to play the raconteur. Pulling pints and engaging in some give and take with the posties who drank during any available free time they had. A well dressed man walked in and made straight for the toilets. A few moments later he exited and was leaving the pub. I loudly said, "Thanks! Come again!" He surged towards the bar and castigated me for daring to draw attention to him, assuring me he had spent plenty of money here in the past. Still playing to the crowd of drinkers watching this little spectacle, I further mocked him to the sniggers and cheers of my audience. He stormed out and I continued to milk the incident for all it was worth. Later on that day, after the afternoon drinkers had cleared out and the early evening vibe was taking shape, the telephone behind the bar rang. "I'm gonna pay someone to do you in!" I banged the phone down. It was obviously the agitated toilet user I had called out earlier in the afternoon. His lame threat sounded so contrived it was almost laughable. His epithet for black people was a word not usually used in Britain, even by racists. It's as if he recognized that I wasn't a Brit and came up with some lame concoction he thought would rattle me based on stereotypes from Hollywood movies. Still, it did give me pause. Over the next few days I probably scanned the crowd a few more times and with closer scrutiny than usual. And that is the most obvious reason why people make threats. To a large degree, they work. Anyone who says otherwise is being disingenuous or has never been on the receiving end. Relative to the amount of effort required, a threat is one of the most effective fear-inducing tactics in the miscreant's trick bag. And, the likelihood of being caught is low. 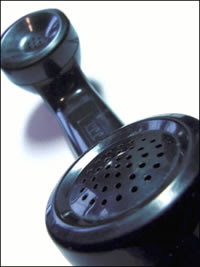 Even if a verbal threat is not made anonymously, police are unlikely to act unless the person making the threat is known to them, or there is some kind of audio or video recording. It would be hard to quantify the number of threats made to the times actions actually are carried out. It's safe to say that most people who make threats never go any further simply because those who are serious about committing a crime usually don't want to be caught. That's cold comfort for victims of stalkers, who seem to have fully embraced their obsessive lunacy and often preclude violent attacks with nasty threats. Terrorists as well trade in the business of spreading mind-numbing fear before following through with some cold blooded human destruction. In this age of hysteria, threats are probably taken more seriously by more people than at any time in history. Most men who are threatened try to appear dismissive while a sliver of apprehension crawls up their spine. When a threat is made by someone with a violent reputation, the reaction can be more visceral and the attempts to hide fear pointless. Unfortunately, women no doubt suffer more than men when they are threatened. On the other hand, they may receive more attention and their claims may be given more credibility when they file a complaint with police. There is no fail-safe way to respond. Bravado may spur some on to carry out their threats while others may be emboldened by a frightened response. Use your own instincts and your knowledge of the creep in question to take appropriate action. There's a fine line between over-reaction and self-preservation. 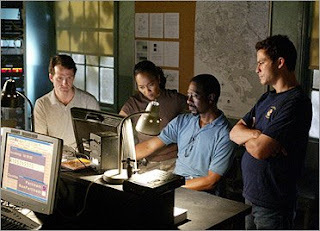 Dexter Morgan is a blood splatter analysis expert working as part of the forensics team in the homicide division of the Miami-Dade police department. Dexter's secret is that he tracks down and butchers criminals who have escaped the law. 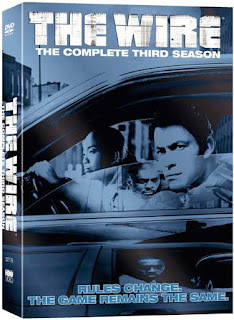 The idea of someone working within the police department by day and operating as a murderous vigilante by night was a unique and intriguing concept that the creators of the show pulled off with success during the first two seasons. The dark humour combined with the jolts of pure drama and suspense worked well. Looking back, such a combination had to be done almost perfectly for it to hang together. However, the third season of Dexter ranks as a major disappointment. Even in those first two seasons, you could feel the suspension of disbelief get a bit wobbly at times. As the season finales approached, the humour got shunted to one side and the story-lines converged and exploded into the climax. That fine line between ridiculous and seriousness was suddenly gone and the closing drama in each season had to be well executed to succeed. You couldn't help but admire the performance of the writers, actors, and directors for actually making it work. 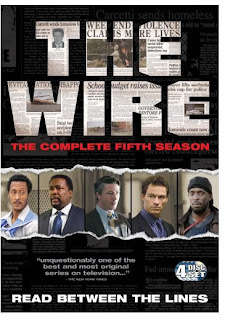 However, during the third season, that suspension of disbelief falls completely out from under the viewer. Absurdities abound, the writers fail in ramping up the suspense, and any semblance of broader themes that existed before are rendered almost meaningless. 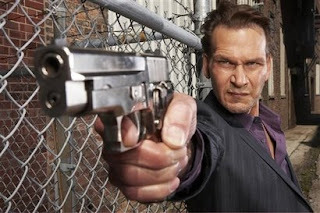 First, the notion that Dexter would so readily take on an accomplice and share his secret with an outsider as he does with the Miguel Prado character (played by Jimmy Smits) just doesn't wash. Any plot twist or character development is believable if done right. But here, the attempts are ham-fisted and the results sometimes border on the ludicrous. Smits does a decent job with the material he is presented with. The Prado character is highly cliched from the beginning: an emotional, hot-blooded Cuban American who has a free pass from all the other one dimensional Cubans because Prado is a local hero. The problem here is that things "just happen" without the appropriate level of suspense or in ways that aren't believable for the characters the audience has come to know. In the world of dramatic writing, this failure to adequately create suspense is known as "jumping." This is something that plagues the entire third season of Dexter. There are several story-lines that simply don't work and are, at times, unintentionally farcical. First, the character of Camilla Figg, who has been a connection to Dexter's past throughout the series, is dying of cancer. Dexter visits her in the hospital on numerous occasions and plays along with her desire to sample the perfect key-lime pie before she kicks it. 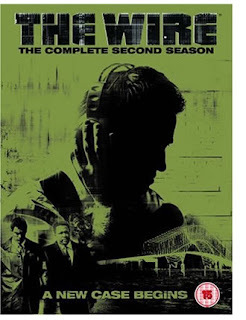 Perhaps an attempt at the quirky, noirish aspects layered with double meaning that worked in the first two seasons? Regardless, it simply falls flat. Easily the most saccharine, melodramatic scenes to play out in the series and ineffective as part of any attempts at character or plot development. Also, an Internal Affairs detective named Yuki Amado starts badgering Debra Morgan, trying to convince her to provide information on her new partner, Joey Quinn. Yuki is a foul mouthed little viper and, not surprisingly, she and Debra take an instant dislike to each other. Finally, Debra tells Quinn about the entreaties, then in turn lets Yuki know she has revealed all to her partner. Yuki discloses that Quinn may have been responsible for the death of a police officer. Apparently, this revelation is supposed to rock Debra and the viewing audience to its core. But why wasn't this little tidbit mentioned by Yuki in the beginning? Perhaps that would have spurred Debra to consider informing on her partner (though what relevant information she could have provided is never mentioned). This sub-plot comes across exactly for what it is: an ill thought out storyline made up on the fly. The thread peters out in an completely irrelevant way, leaving the viewer to wonder why it was included in the first place. An indication that the well of ideas has run dry is that a serial killer appears who is very similar to the season one monster. Same consistent pattern, same cutesy nickname, same surreal crime scenes. 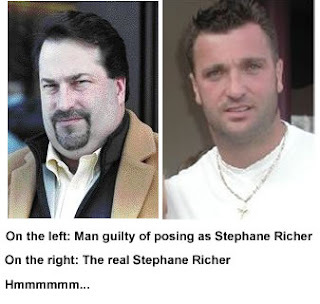 Only this time around, there is none of the intrigue of the Ice Truck Killer from season one. 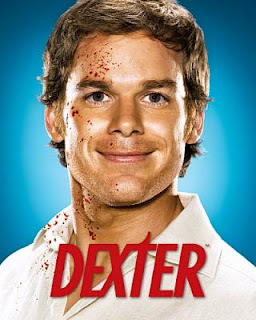 The back story of Dexter's development as an apparent ruthless sociopath seems to have run its course. The image of Dexter's long dead adoptive father is still here, warning against all the decisions he makes, all of which turn out badly. In seasons one and two, Dexter's father showed up in entertaining flash-backs that provided necessary information to the viewer. However, in season three his father appears as an illusion or apparition visible only to Dexter during scenes involving other characters. Simply not as effective as the flashbacks. The ostensible themes that showed up in the first and second seasons are eviscerated this time around. Any sense that all the torture sessions that eventually lead to murder are somehow justified no longer holds water. 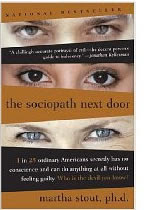 More and more, the lead character comes across as a self-serving, sociopathic murderer. As an antidote to this, the Dexter character's voice over comes to the rescue numerous times with some convoluted logic in the hopes that the viewer will keep tuning in and going along with the premise. It seemed fairly evident in season one and two that Dexter was destined to evolve and realize he did in fact have feelings and was largely a product of his upbringing. He showed feelings towards his step-sister and girlfriend, and he had a code he adhered to (i.e. morals, however twisted). These themes don't seem as credible after season three. These shortcomings only further highlight the fact that Dexter operates in a department full of what must be utter buffoons and incompetents who have no idea he is a serial killer. Again, the glaring holes for which audiences are endlessly forgiving if they are presented with a class A drama. When things start to falter, those inconsistencies and flaws become annoyances and start to drive people away. The show has been renewed for a fourth season and if the producers can't recreate some of the earlier magic, this show should die a rightful death. 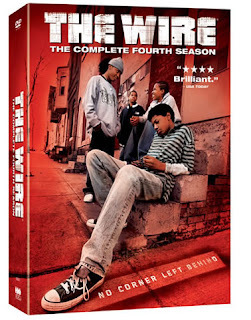 Many viewers couldn't see the show going beyond season one but were pleasantly surprised with the follow-up. The same concerns were voiced after season two and season three has mostly confirmed that line of thinking. A handful of teasers from the end of season three will likely be explored next year. It appears Dexter is actually Debra's half-brother and not only a step-brother. Also, Dexter's wife Rita (they were wed in the concluding episode of season three) was apparently married for a brief time as a teenager; something which she is hiding from Dexter. However, the brazen way these facts were telegraphed to the audience provides little hope they will be developed in a convincing way that can salvage the series. Was season three of Dexter a complete write-off? Despite all the problems listed above, it was still watchable. The noirish shots of Miami, the occasional bursts of memorable dialogue, and the performance of Michael C. Hall as Dexter were all bright spots in an otherwise disappointing season. Most viewers probably kept watching in hopes of seeing the standard rise close to the levels of previous seasons. 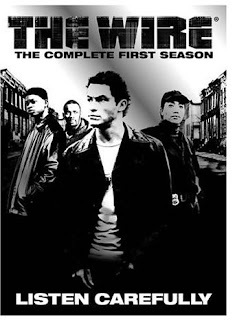 There was a lot of capital built up in seasons one and two that kept many fans loyal. Or perhaps many viewers simply get a kick out of the whole concept and enjoy those nasty scenes where Dexter plays judge, jury, and executioner. John D. MacDonald was one of the most prolific crime writers to ever put pen to paper. MacDonald published more than 70 novels (not all in the crime genre) and 500 short stories during his lifetime. Probably best known for the 21 Travis McGee novels he wrote, MacDonald spent most of his adult life banging out millions of words of prose at home in Sarasota, Florida. 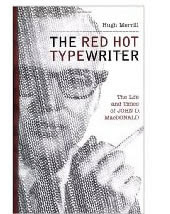 A biography by Hugh Merrill entitled The Red Hot Typewriter: The Life and Times of John D. MacDonald, chronicles the life of one of the most popular crime writers who ever lived. Some biographies are mind numbingly thorough in chasing down every living person who ever interacted with the individual in question. Such weighty tomes ensure that no stone is left unturned and no detail left unexplored. Thankfully, The Red Hot Typewriter is not one of those biographies. That may be a disappointment to some, but others are just as likely to welcome a lighter, more readable volume. Perhaps Merrill was attempting to emulate the lean writing style that MacDonald was known for in many of his Travis McGee novels. Neither are there any lengthy interviews with family members or friends of John D. MacDonald. The book is based mainly on letters that MacDonald wrote, and observations and opinions of the author. There are, of course, the requisite passages devoted to the childhood of MacDonald, but things quickly shift to his writing years. As the lives of some of the past century's greatest writers go, MacDonald's certainly can't be classed as dramatic or overly interesting. But when you churn out so many books and short stories, how much time do you have to get up to real-life adventure? For that reason, the book probably won't appeal to those readers who aren't fans of MacDonald. But Merrill himself clearly is a fan, and his narrative style results in an entertaining and enjoyable book despite the fact that MacDonald led a relatively low-key and conservative life. The biography rightly focuses on MacDonald's writing but we also discover other aspects of the great crime writer's life. His lifelong concern for the environment, his love of cats, and his battles with property developers in Florida are just a few of the things that kept MacDonald occupied when he wasn't writing. Despite their wealth, MacDonald and his wife didn't lead extravagant or flamboyant lives. One of their greatest shared passions later in life was going on boat cruises. MacDonald was such a faithful and committed husband that he was overwhelmed with regret at engaging in a "tryst" that consisted of exchanged glances at cocktail parties and a few emotional conversations. MacDonald dutifully admitted his lapse to his wife and was quickly forgiven. Merrill writes briefly about the non-scandalous, non-affair but MacDonald's life didn't lean towards sleaze, and the biography doesn't seek out gossip or make innuendos. Once he had a character, he had to decide how to distinguish one McGee book from another. He didn't want to number them, because then a reader might feel compelled to read them in order. MacDonald discussed this problem with friends on a trip to New York. "Musical terminology, days of the week, months of the year, varieties of gemstones--all of these were discarded, and I believe it was Knox Burger, who edited all the early ones, who suggested colors." The repeated attempts by movie studios to bring Travis McGee to the big screen also make for interesting reading. MacDonald was torn by the idea, at once not wanting to lose control of his creation but also craving the enhanced legacy that a well-made film could have brought. The unique elements of the McGee novels meant that a successful transition to film was never made. MacDonald also discusses his hopes and fears in many of the letters that Merrill references in the book. We find out that MacDonald could never wrap his head around the whole race issue that was gripping the U.S. during much of the 1960s and 70s and he never worked the theme into his books in any convincing way. MacDonald was a drinker for most of his life but it was never a major problem. However, together with his smoking habit and overall sedentary lifestyle, it probably contributed to his death in 1986 at the age of 70. After reading The Red Hot Typewriter, you will probably have a greater appreciation for John D. MacDonald as a writer and will likely also see him as a reasonable and decent person. 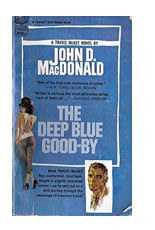 The Deep Blue Good-by was the first of 21 Travis McGee novels by the late, great John D. MacDonald. McGee is a nihilistic, misanthropic loner who lives on his boat, The Busted Flush, which is docked in a marina in Fort Lauderdale, Florida. He has largely dropped out of mainstream life and only works when he runs low on cash. "You said if X has something valuable and Y comes along and takes it away from him, and there is absolutely no way in the world X can ever get it back, then you come along and make a deal with X to get it back, and keep half. Then you just...live on that until it starts to run out. Is that the way it is, really?" McGee accepts this version and thus the reader has an idea of what kind of character they are being presented. He is a sort of private eye, but not exactly. However, like most of the well known hard-boiled private eye novels, this McGee story is a morality play. 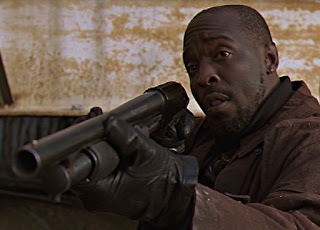 And like most of the hard cases who came before him in the pulp fiction world, behind the tough talking, fearless forays into dangerous situations, McGee is also someone who genuinely cares about the people he tries to help. It’s almost as if MacDonald fashioned McGee as a combination of the hardened crime novel detective and the sensitive new age man who was gaining prominence at the time (The Deep Blue Good-by was published in 1964). The typical sleuth/lothario, McGee comes across his share of attractive and troubled tarts. He rebuffs some, sleeps with a few, and feels regret at leading others on. These philosophical asides (and later in the series, conversations with a character named Meyer) became one of the trademarks of the McGee novels. They are one of the aspects that fans of the novels like the most but probably one reason the books were never successfully adapted to the big screen. The book is written in the first person using simple, lean sentences that move the action forward. The plot is almost secondary here. McGee’s observations, monologues, and dialogue with other characters are the driving force behind the story. Not that there isn’t any plot or action. McGee tracks down the nasty piece of work who has abused and cheated the two main female characters. While McGee is a nuanced individual who doubts himself and doesn't always play by the rules, the villain is pure evil. The action builds to a brutal showdown in which all does not end in a pat, satisfying way. A taut, sparsely written novel that is the first in the classic Travis McGee series. Please feel free to comment and send in requests and potential stories.